Losing someone you love is difficult beyond words. We will always cherish the precious memories and will be reminded of them always. Our Memory Tree is a beautifully unique sculpture which provides the opportunity for a wonderful and permanent tribute to those we want to remember and celebrate. Each branch displays almond shaped leaves in bronze, silver and gold which can be engraved with the name of your loved one. 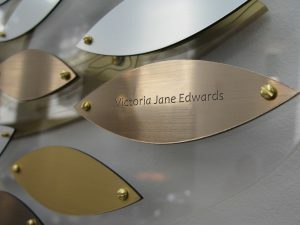 Your leaf tribute will be displayed on our tree which sits in the reception area of our inpatient unit in for a minimum of either one, two or three years, or even longer should you wish. You will be given the opportunity to renew your leaf or have your leaf returned in a presentation box for you to keep. You are welcome to come and view your leaf and reflect in our comfortable and welcoming surroundings at any time. It is our pleasure to offer the Weldmar Memory Tree as a meaningful way to celebrate the lives of loved ones that are no longer with us. This tree will help fund the continuation of our care across Dorset so that we can help more families spend more precious moments together. 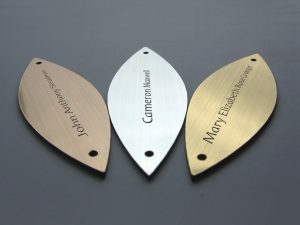 When your leaf is due for renewal, we will contact you to give you the opportunity to dedicate the leaf for another chosen period or have the engraved leaf returned to you in a presentation box.